Dracula is by Davidor. 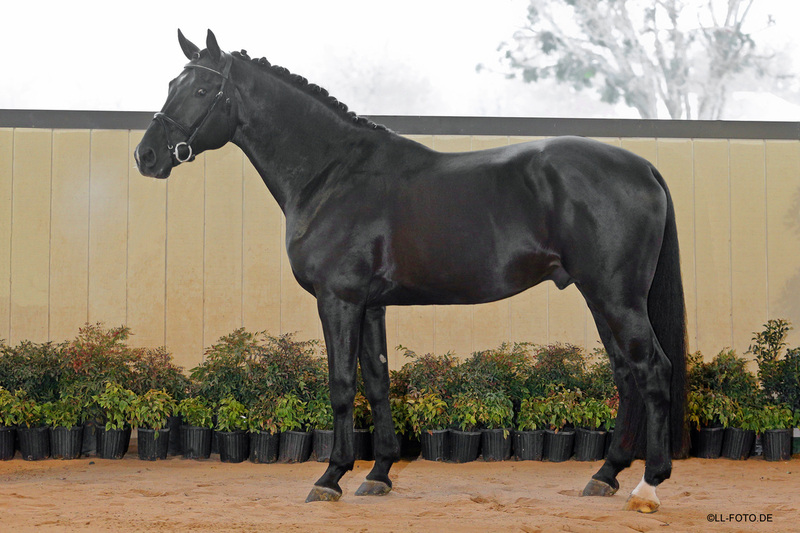 Davidor, an impressive black Hanoverian stallion by Davignon and out of Wanessa (Warkant/Eiger). Davidor was a proven FEI stallion, having shown successfully through Intermediare in Germany before his importation. His sire, Davignon I, is considered to be one of Donnerhall’s best sons, having earned Class I scores at his licensing in 1991 before going on to win the Bundeschampionat in 1992. Davidor’s damsire, Warkant, is by World Cup I, who also sired the famous Weltmeyer. Like Davignon I, Warkant earned Class I scores at his performance testing and is the sire of numerous approved sons, as well as top competition horses such as Hubertus Schmidt’s Olympic mount, Wansuela Suerte. Davidor’s dam, Wanessa, is a proven producer and a Bundeschampionat winner as well. She has consistently been represented at stallion licensings by her sons and produced mares of top quality.